The sounds of a simple 555 LFO patched to a pitch resistor of just about any black blob toy can be mind bending for sure. This particular Hasbro PS-625 Xylophone does have a lot of cool animal sounds, which sound super rad pitched way down. However something that this device does not have is lots of room on the inside. So an external breakout box with knobs and a coiled cord was attached. The cord is a standard telephone headset cord, unfortunately it only has 4 conductors. 2 were used for power and the other 2 for leads to a pitch resistor located on the backside of the board. 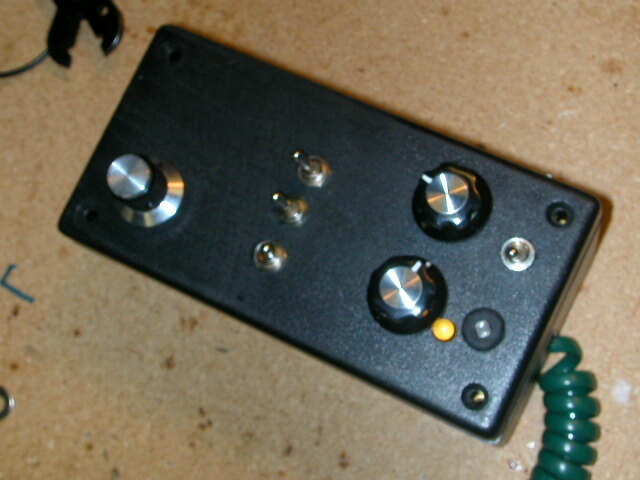 A 1 Meg Ohm pot was used for the pitch control and the output of a 555 circuit is patched to that with a switch. The photoresistor can be switched off and on to replace one of the pots in the circuit for optical control over the LFO frequency. 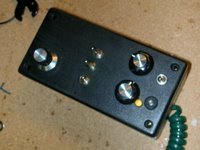 The other switches on control Ramp vs. Square wave as well as capacitor substitutions for Low and High oscillations of the 555. This toy does seem to crash hard once in a while to the point of battery removal , so a simple reset switch was added to short the + and – of the battery leads together for a full reset. Once again, more build photos are in the GetLofi Gallery and the video is available for enjoyment.